their new shed during the off-season. GRETNA Cricket Club held its annual general meeting at the Gretna Green Hotel on July 24. Office bearers elected for the coming year were Peter Rainbird (president), Wade Gleeson (secretary) and Glenn Blackwell (treasurer). The club's patron is Phillip Sharpe. The club will once again enter two senior teams in the Southern Cricket Association, with Gretna I in Second Grade and Gretna II in Third Grade. The club will also field a team in the Under 13 and Under 16 divisions of Cricket Tasmania's Youth League competition. A big addition to the playing surface at the Gretna War Memorial Recreation Ground for this season will be the new irrigation system that has been installed by club members over the off season with funding from the Central Highlands Council. 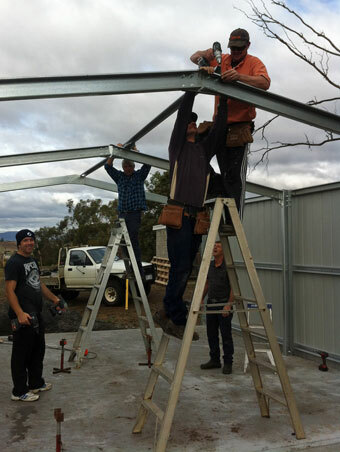 Another project completed by club members was the building of a new shed for the club's mower. The club acknowledged the support of sponsors State-Wide Earthworks, Gretna Green Hotel, Derwent Valley Glass, New Norfolk Hotel and Cheeky Little Place.